Social selling isn’t rocket science — but in many ways it’s treated like it is. There is definitely a right way and a wrong way of doing it. There are places you shouldn’t have sales professionals waste their time. There are shortcuts and social selling tips and “tricks” that can help accelerate results quickly. One of the best things you can have your salespeople do is practice social selling daily. Here is a routineyou can try if you’d like to practice social principles that are tied to revenue-generating activities. Are you practicing social selling daily already or wondering how to? Tweet me your thoughts@AmarSheth or connect with me on LinkedIn to share. As LinkedIn continues to change the UX (user experience) there are some things that have a significant impact on workflow, and this is a good one. Over the years I have had to put hacks in place to make sure I engage with every new connection, but no longer. With the new feature in place, when someone accepts your connection request, you are notified in your inbox. This makes it is simple to send a welcome message that starts the conversation. You will see “Name has accepted your invitation” and if you have included a custom invitation, your note will appear in the messaging thread. Name, Thank you for connecting with me on LinkedIn. After visiting your profile I noticed (SAY SOMETHING RELEVANT) and thought it might make sense for us to connect. If you are open to an introductory phone call, we could explore ways we may be able to work together now or in the future. To make scheduling easier, here is a link to my calendar http://ScheduleaCallwithBrynne.com – please pick a time that best works for you. Name, Thank you for connecting with me on LinkedIn. I am not sure if you are using LinkedIn for sales, but if you are I want to share with you some of our LinkedIn messaging templates that can have a big impact on your business development effortshttp://sslink.co/PeopleLinxLinkedInTemplates. BONUS: The “Keep in Touch” opportunities show up here now too! The best of social sellers leverage LinkedIn groups to their highest potential to develop relationships while generating warms leads for themselves. However, often, we are not sure how to identify which LinkedIn groups our buyers are a part of. If you are using the LinkedIn advanced search option to build your buyers list, it is very easy to identify Groups your buyers are active in. After filling in the criteria of your buyers, press ‘Search’ to go to a list of all your buyers. When you scroll down the list, you will notice a ‘Group’ option. The groups mentioned here are the groups which have a maximum number of your buyers involved. If you are targeting only a few companies, simply add all your target companies’ names in the ‘Current company’ box and tick any other search criteria required. LinkedIn will still tell you which of your buyers are part of which groups. Your job is not done yet. A group with a higher number of your buyers might not be the ideal group for you chose to target your buyers. You will need to check the Group statistics and see if this group might serve your purpose. Give priority to ‘Number of comments’ than ‘discussions last week’ or ‘promotions last week’ to better judge the relevancy of a group. This information shows if the group is actively used by members to engage in discussions or if it is just a dump yard for promotions. I generated two warm leads in April by developing relationships in couple of groups I’m active in. How about you? I would love to hear some of your success stories. While the Skills & Endorsements section on your LinkedIn profile has always helped your SEO, it just got a lot more valuable to you. Earlier this year, LinkedIn said it would add a Skills filter to its Recruiter product. The filter lets users search for LinkedIn members by the skills they have listed in the Skills & Endorsements sections of their profiles. I’ve now seen two reports from users that the filter is live, one from Irina Shamaeva here and another from Randy Bailey here. If you have built out this section of your profile and you have endorsements, this new filter will make you more visible to thousands of recruiters. Good job! Look at your listed skills to be sure they include terms that recruiters would use to find someone like you. Use LinkedIn’s standard terminology when you can. For instance, I could use “resume writer” or “resume writing.” I chose “resume writing” because LinkedIn suggested it. Do Endorsements Matter for SEO? We don’t know how much the number of endorsements you have matters for your SEO, but it’s a safe bet it’s in LinkedIn’s algorithm. As a recruiter, if I’m using the Skills filter, I would want to see people who have the most endorsements for a skill given some priority in my search results. I’m glad to see LinkedIn start to deliver more value from Skills & Endorsements. The Skills filter is an element of the company’s Economic Graph strategy and an incremental step forward in utility for everyone. I’m always happy when a little friction gets taken out of the job market! I write executive resumes and LinkedIn profiles. Save time. Get hired. Email me at donnasvei@gmail.com or call me at (208) 721-0131. This is a great infographic from one of my closest friends and a fountain of knowledge on all things LinkedIn. Are you “using” it? Or are you just there? How good is your etiquette on LinkedIn? 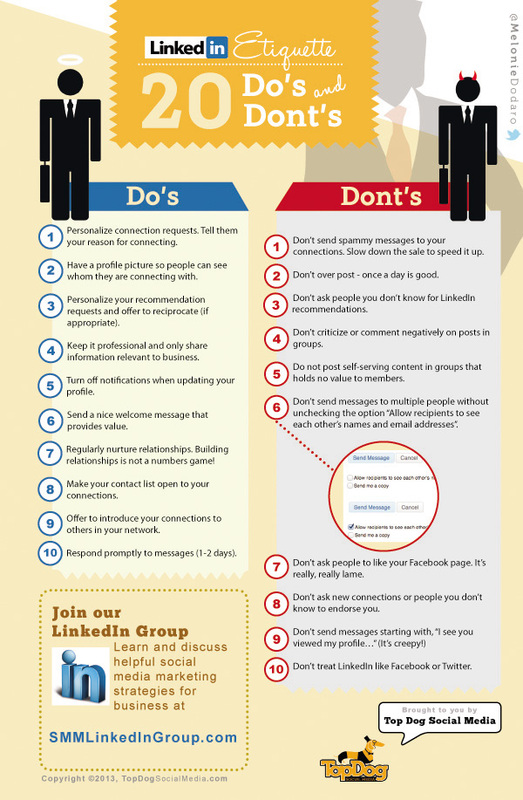 This greast infographic by Top Dog Social Media gives you twenty do’es and don’ts! Profile Picture: Make sure you’ve got a profile picture, if you can, get a professional to do it. Invitations: Personalise your message, every time. Connect: Introduce your connections to others in your network. What are your take-aways or what would you add? I noticed yesterday when doing some LinkedIn fine tuning that we can now sort ALL of the skills we have listed under the endorsement section. Previously the top ten of your listed endorsements where sorted, top down, and we were unable to rearrange. The following forty however we could move as we saw fit. What frustrated me, and many I speak to, is that we acquire new skills regularly and need these visible to help with our credibility. Not many of us will scroll and click to see the hidden skills. This is a great change to the format and one that will help us all and highlight your new skills to those that view your profile. I agree, its not a perfect system, but neither the less its evolving in the right direction. Only downside, until someone endorses a skill you have moved it sits there with no validation. Could this have an adverse effect? So take some time now and move your new skills you want your network to see and pay it forward, endorse someone. Though ONLY if you have experienced that skill. Or even better – write a recommendation for that person. Are You Ready For Social Selling? Social Selling is the process of finding and connecting potential leads and prospects via social media to increase sales. The Aberdeen Group define social selling as the utilisation into one of three techniques. These three techniques include Social Collaboration, External Listening and External Participation. There are many studies available that demonstrate why you need to evolve your traditional methods to involve social media, none more important than this. On average – 60% of the purchasing decision has already been made, prior to a sales person being invited to the discussion. Someone is educating and providing insight to your clients – is it you or your competition? Thirty Six percent of companies who have a social selling team are more likely to achieve quota. The top 3 goals of B2B marketers, as depicted in the infographic below, are brand awareness, lead generation, and customer acquisition. Twitter is definitely a powerful tool to accomplish all three.